Please Support Elephant Health and Well-being in Vietnam! 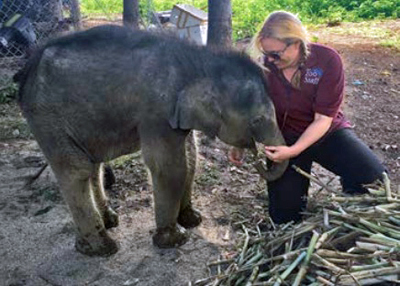 Erin Ivory, the NC Zoo's Elephant Manager, visits Vietnam frequently to promote the health and conservation of Asian elephants. Last year, she was key to saving the lives of the two orphans, Jun and Gold, rescued by the Elephant Conservation Center. Her success with these calves inspired their caretakers to learn, and begin relying exclusively, on positive rewards to manage these youngsters and other Center elephants. In Vietnam, she advocates to improve the care and treatment of privately-owned elephants in the logging and tourist industries; teaches workshops on humane, positive training methods; works with the national government on long-range conservation plans; and cooperates with a network of experts who provide training,outreach, veterinary, and other services to Vietnam's elephants. Your donation will help ensure that her work can continue without interruption. PS: You can read more about Erin Ivory and her work in Vietnam in the Fall 2016 Alive feature article Helping Wildlife Around the World and in the Fall 2017 Alive, Undate on the Zoo's Asian Elephant Work.